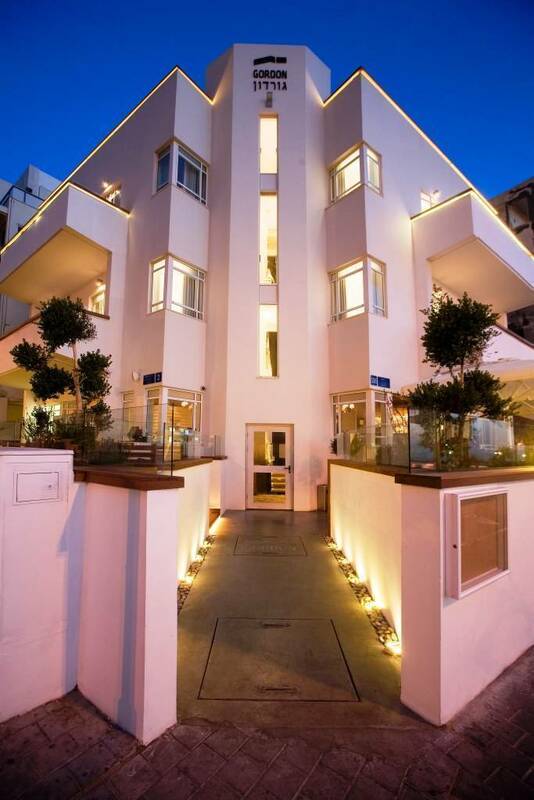 Tel Aviv-Yafo (Tel Aviv), Israel - 2 J. L Gordon St., 136 Hayarkon St.
A new luxury boutique hotel in a prime position on Tel Aviv’s vibrant seafront. Specializing in a Personalized Concierge Service, the hotel promises an unforgettable stay in the City that never sleeps. At the entrance to the hotel located is the SALT kitchen & drinks restaurant, offering a Mediterranean cuisine. 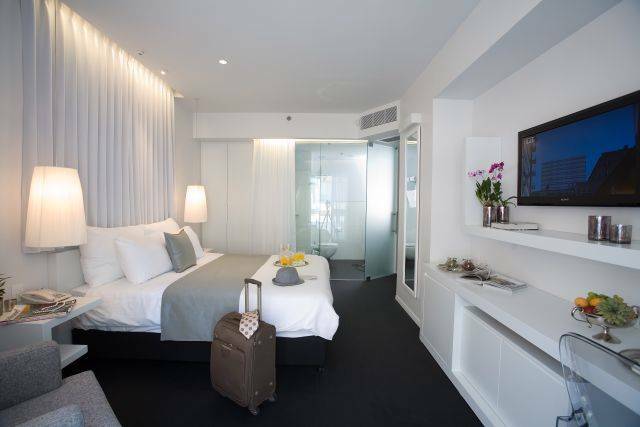 Gordon hotel & lounge is superbly located on Tel Aviv's vibrant seafront on the corner of Hayarkon and Gordon Street. It's fabulous location enables you to start off your day on a white terrace overlooking the breathtaking Mediterranean Sea. 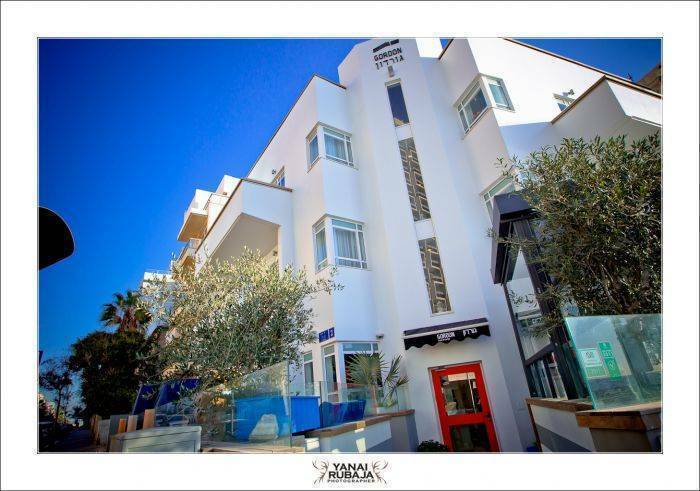 Recently renovated, the hotel building is one of the Bauhaus landmarks which give the City of Tel Aviv, also known as the White City, its fame as a world heritage site. The design concept of the hotel reveals the historical architectural features of the White City which, combined with its modern and innovative design, create a luxurious and spacious ambiance. Control systems that enables you to control the lighting, curtains, climate control system, Queen-Size bed, Flat Screen TV with International channels, Rich Mini Bar, In-Room Deposit Box suitable for Laptop, Private bathroom with Rainshower, Bathrobes, Tea and Coffee Making Facilities, Free High-Speed Wi-Fi Connection, Working Desk. 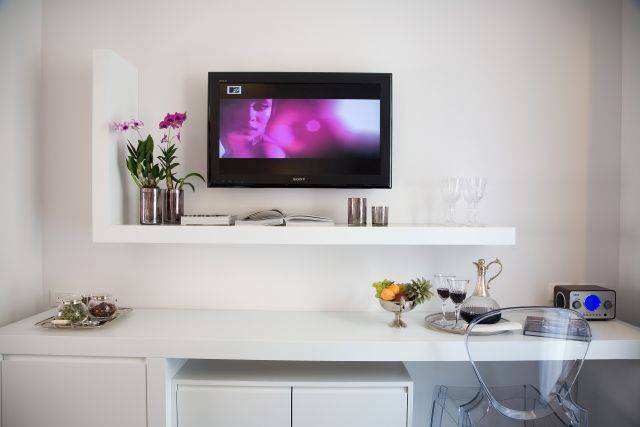 Our rooms offer an intimate and unique atmosphere, providing first class personal attention and tailor-made services by our highly professional and dynamic team. Concierge Service answering all your wishes and expectations. Simply convey your desires prior to your arrival and we will create an itinerary tailored to your individual needs whether for business or leisure. At the entrance to the hotel located is the SALT kitchen & drinks restaurant. The restaurant combines culinary experience, light and young atmosphere and spectacular view of Tel Aviv coastline, designed by Mediterranean inspirations, decorated by bottles of ouzo and anise and salt crystals. The restaurant menu focuses on Mediterranean food, fish and seafood, aside a varied alcohol menu, fits perfectly to the Mediterranean local and international wines and unique cocktails. all within walking distance of the Gordon hotel & lounge. Superior – facing the city side. A quiet room. 16 sqm. In room facilities: Control systems that enables you to control the lighting, curtains, climate control system, Queen-Size bed, Flat Screen TV with International channels, Rich Mini Bar, In-Room Deposit Box suitable for Laptop, Private bathroom with Rainshower, Bathrobes , Tea and Coffee Making Facilities, Free High-Speed Wi-Fi Connection, Working Desk. Deluxe Regular – room with a balcony, facing the city side. 20 sqm. In room facilities: Control systems that enables you to control the lighting, curtains, climate control system, Queen-Size bed, Flat Screen TV with International channels, Rich Mini Bar, In-Room Deposit Box suitable for Laptop, Private bathroom with Rainshower, Bathrobes , Tea and Coffee Making Facilities, Free High-Speed Wi-Fi Connection, Working Desk. 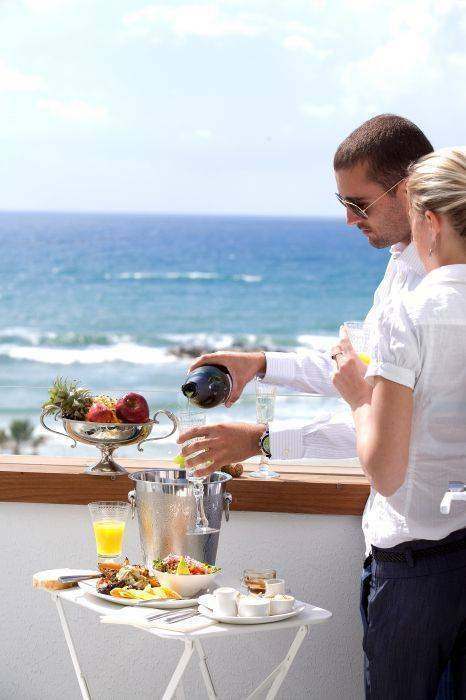 Deluxe Sea View – room with a balcony, facing the magnificent sea. 25 sqm. Control systems that enables you to control the lighting, curtains, climate control system, Queen-Size bed, Flat Screen TV with International channels, Rich Mini Bar, In-Room Deposit Box suitable for Laptop, Private bathroom with Rainshower, Bathrobes , Tea and Coffee Making Facilities, Free High-Speed Wi-Fi Connection, Working Desk. 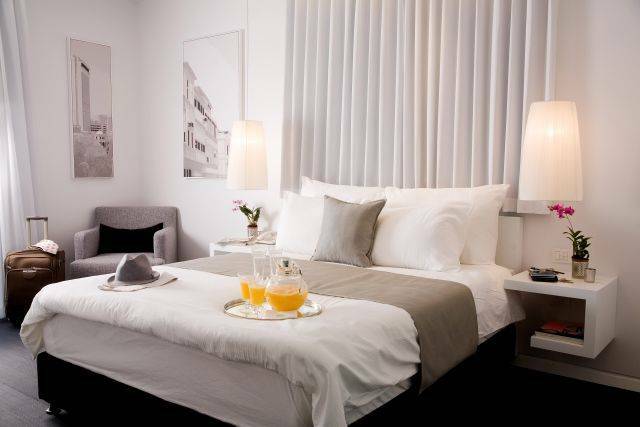 Our cancellation policy requires a written notification of 72 hours before the arrival date. Cancellation fee is 100% of the first nights rate. 2 J. L Gordon St., 136 Hayarkon St.
prime position on Tel Aviv’s vibrant seafrfront. The hotel is located on the corner of the Hayarkon street and Gordon street. Walking distance from Tel Aviv Port, Museums, Neve Tzedek neighberhoos, The Carmel Market, Jaffa, Galleries, Bars & Shopping Centers. Transportation around: Taxi, Buses, 10 minutes from the Railway Station, 30 minutes from Ben gURION aIRPORT.